So, young neonate, you want to know of your history. 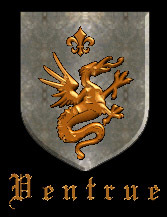 Ventrue was one of the first clans, founded by Ruthven long ago. Our early encounters with other clans were inconsequential, until Brujah (unsurprisingly) launched an all out attack upon us. Our survival of that war earned us an uneasy respect from our violent cousins. Early members of the clan included Jevarrel, Viggalentius, Geddon, Darkmane, Cosmic and Keldorn. Of those early members; two princes, Cosmic and Keldorn, left to join they dying Clan Nosferatu. We helped these new princes of Nosferatu, and their new leader, Valis, wage one of the bloodiest wars in mud history against the clan Tremere. Around this time, Ruthven entered torpor, and a brave new leader named Archon took over the clan Ventrue. Within two nights, every member of Tremere had been butchered and staked, proving to the rest of the clans that while small, the clan Ventrue were cunning hunters and could hold their own against larger forces.The conflict created a bond between Ventrue and Nosferatu that lasts to this day among the elders of the two clans. During the time that followed, Ventrue suffered from many of the same problems that all other clans suffer: clan jumpers, politics, and having to deal with cheats inside the clan. Notable Ventrue members of this time were Wolfchild, Rooster, and Krug. At this time, Archon left the clan to take a position as a Coder, and Ambyth took the reigns of the clan. The clan went after Brujah, and staked the clan into almost total oblivion. Wynn joined the clan, and Krug and Wolfchild disappeared into the unknown. At this time, Ambyth disappeared, and angered by the lack of leadership within the 'Leadership' clan, Rooster staked the newly returned Krug, and then had himself staked and decapped down to avatar. Krug joined the Malkavian Clan temporarily, until he was made Justicar of the clan by Joker and Genghis. Rooster temporarily rejoined the clan, but has again left to join Nosferatu for unknown reasons. Somewhere along the line, a young vampire named Scooby was born, and he helped Krug lead the clan, until a new Diety was born. Azazel has joined the clan and recruited new members, including Selic, Karik, Last, Fletch, and Qualtrar. These young vampires will help lead the clan into the next era of the Vampire Wars.